A controversial Indian politician has been sentenced to life in jail for having ordered the murder of a rival politician in 1998. 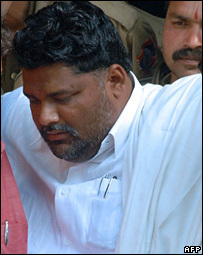 Rajesh Ranjan, alias Pappu Yadav, was convicted of ordering the assassination of Ajit Sarkar, a popular left-wing legislator in impoverished Bihar state. While in prison, Mr Ranjan contested and won a seat in parliament for his party, an ally of the government. His case provoked concern over the involvement of criminals in politics. Indian law permits politicians facing criminal charges to fight elections. Only convicted criminals are barred from seeking public office. Mr Ranjan is expected to remain an MP until the next election. He has said he will appeal against Thursday's verdict. According to Social Watch India, an advocacy group quoted by the Reuters news agency, more than 30% of Indian legislators aged between 36 and 45 face criminal charges.